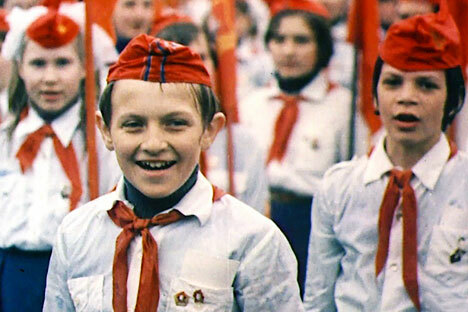 The political is personal in "My Perestroika"
An extraordinary documentary looks at the generation of Russians who came of age in the turbulent time surrounding the fall of the USSR. It’s difficult to say if My Perestroika is really a political documentary or a simply personal one. It has no interest in talking heads, in featuring political analysts or in exhaustive lists of events and statistics. Instead, it’s a highly subjective and often very intimate examination of the lives of just five Muscovites. Four were originally classmates in the capital’s School #57; all grew up as the Soviet Union collapsed around them and found themselves adults living in an uncertain future that for which nothing had prepared them. Though some of them have gone their separate ways, taking very different paths in life, they remain somewhat united in spirit by something that falls between realism and cynicism. It’s not difficult to see why they have so much to say about their experiences. Theirs is a generation caught between two very different times, a generation that endured a difficult transition over a relatively short period of time and whose experiences, no matter how subjective, give a unique and often very articulate insight into Russia’s transformation. They describe a coming of age that was not merely the usual loss of innocence, but that also saw them lose all the certainties and securities of a communist state that had alternately protected them and dictated to them. Now, they find themselves raising their own children in a Russian Federation that some choose to embrace while others reject, but which they all look upon with a very critical eye. Borya and Lyuba Meyerson, a married couple who now both teach history at the school they once attended, recall safe, idyllic and plentiful childhoods in the Soviet Union, but can’t help but laugh at their former idealism. While they enjoyed “the country of happy childhood,” remembering summers that never ended, good food and many presents under the tree at New Year, they see through their Soviet upbringing. “I can’t say I wanted to be like everybody else, I simply was like everybody else,” says Lyuba, who laughs at her former Pioneer spirit, while Borya remains equally unimpressed with modern Russia. He describes a hypocritical Soviet Union in the 1980s, one where “no-one really cared,” where the state continued to pretend it was turning its children into diligent communists while “People all around you were saying things that didn't correspond at all with reality... You saw with your own eyes that they say one thing and do something totally different.” He soon makes it clear that he sees a similar separation between rhetoric and reality in Russia today, telling his wife they would be better off trying to vote in American elections than Russian ones. Footage of the couple teaching their history classes shows them wrestling with the complications of their Soviet past. Two opposite sides of the post-Soviet coin are provided by successful businessman Andrei Yevgrafov, who has embraced capitalism and made money importing French designer shirts, and Ruslan Stupin, an idealist and former punk rocker who now busks and largely rejects a modern Russia he believes has killed the socialist and moral values he grew up with. But when Ruslan meets with the Meyersons to ask if children still read any more than the Bulgakov they are given at school, it’s difficult to imagine him as any different to other concerned, even conservative parents, bemoaning modern trends. Andrei, meanwhile, though enjoying his success, worries that Russia is sliding towards another autocracy, something he says has always been its fate. The fifth subject is single mother Olga Durikova, who makes her living working for a company that rents billiard tables. She is also cynical about living under Vladimir Putin and Dmitry Medvedev, and it is easy to imagine her much more comfortable in an imperfect Soviet Union where at least her job, her home and her income would have been guaranteed. She looks washed out, passed over, and gives an almost offhand description of the cruel murder that took her last partner from her.